Posted on Sun, Mar 4, 2012 : 5:58 a.m. This home on Maplewood Avenue in Ann Arbor is one of many that went into foreclosure during the state's foreclosure crisis. A new report shows that $63 billion of Michigan’s housing value was lost between 2006 and 2010 when the state was in the deepest depths of its continuing foreclosure crisis. The county-by-county report, conducted by the Michigan Foreclosure Task Force and Grand Valley State University’s Community Research Institute, highlights the increased residential foreclosures, loss of property value and increased vacancies that swept through Michigan during that period. From the hardest hit -- Wayne County -- to rural areas and Washtenaw County, 416,116 residential units in Michigan went through foreclosure auction filings between 2005 and 2010. Those statistics, said Steve Tobocman, co-director of the Michigan Foreclosure Task Force, are the worst Michigan has seen since the Great Depression. but the impact in the housing industry has never been as profound as it has been,” he said. 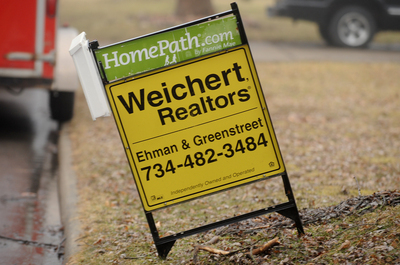 Locally, the monthly average of mortgages foreclosed in Washtenaw County in 2005 was 146, according to the data. That number increased each year, reaching 845 in 2010. With foreclosure rates increasing, the county’s total residential state equalized valuations -- or assessed values as finalized by the county and state process -- fell from $12.7 billion in 2006 to $10.3 billion in 2011, a decrease of 18.8 percent. Washtenaw County’s vacant housing units also increased by more than 80 percent during the decade, rising from 5,742 in 2000 to 10,380 in 2010. And these numbers, Tobocman pointed out, aren’t isolated to just “urban” areas in Michigan. Signs with HomePath.com -- a foreclosure website owned by Fannie Mae -- signal foreclosures in the area, with this one located on Maplewood Avenue in Ann Arbor. The report cites Michigan’s high unemployment rate and the 40 percent drop in auto sales between 2008 and 2009 as contributing factors to the foreclosure crisis — factors that made Michigan one of the hardest hit states in the country, Tobocman said. During that time, state unemployment increased from 8.3 percent to 13.3 percent. More recent data on Michigan and Washtenaw County’s unemployment rates is more encouraging: Michigan’s unemployment rate fell to 9.3 percent in December, the lowest in more than three years. Similarly, Washtenaw County’s unemployment recently fell to 5.2 percent in November 2011, the lowest rate in the state. At the same time, home sale prices and listing prices in Washtenaw County have recently increased and are projected to rise heading into the spring market. Another indicator, the number of sheriff’s deeds sold in Washtenaw County, was the lowest it has been since 2006 at 1,128 last year. He said that although some counties have seen property values and home sales increase in recent months, home values are nowhere near where they were prior to the crisis. Wayne Esch, a local agent with Real Estate One, nodded to the recent increase in Washtenaw County average home prices, but pointed to some local neighborhoods where homes have actually lost value. For instance, although Ann Arbor homes gained 3.57 percent in value in 2011 based on sales prices per square foot, certain neighborhoods -- such as those around Allen, Northside and Lawton elementary schools -- showed a drop in value from 2010 to 2011. “You need to look at each community, but overall things are getting better on an average for the county,” Esch said. Nancy Bowerbank, a local real estate agent with the Charles Reinhart Co. who deals with foreclosed homes in the area, predicted that Washtenaw County will still see a good amount of foreclosure activity for a couple more years. That activity will have an effect on the entire market, bringing down home values in neighborhoods with foreclosed houses. "If a house sells at a distressed price, it's going to have an impact on prices in the neighborhood because buyers draw some inferences about values in the area," she said. She also noted that if a neighborhood has a significant amount of distressed homes -- somewhere around 30 or 40 percent -- it will affect appraisals in the entire area. 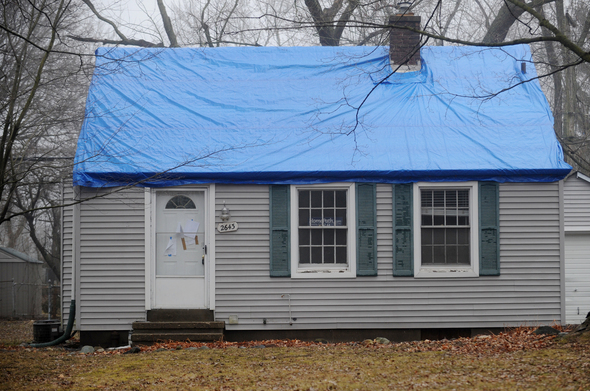 Statewide, Tobocman projects there could be another 100,000 foreclosures in the coming year, a number that proves “there is a lot more crisis to go through” until markets are restored. To help homeowners deal with and understand the crisis, the Michigan Foreclosure Task Force is launching an interactive tool kit, which will include foreclosure prevention strategies, vacant property strategies and connect people with housing consultation and other resources. Wed, Mar 7, 2012 : 4:41 a.m. The Ann Arbor Assessor probably has this house valued at about 160,000 bucks with an SEV of 80,000. That'shis idea of maintaining property values. Tue, Mar 6, 2012 : 2:35 p.m.
For people who want to read the report, it can be had at <a href="http://www.cridata.org/filedl.aspx?f=michiganforeclosuretaskforce/pdf/MFTF_Report_February_2012_Final.pdf" rel='nofollow'>http://www.cridata.org/filedl.aspx?f=michiganforeclosuretaskforce/pdf/MFTF_Report_February_2012_Final.pdf</a>. You can get to that link by following the link given in the article to the Grand Valley State University Community Research Institute. Mon, Mar 5, 2012 : 4:18 a.m.
Val: The vast majority of students live off-campus and pay property taxes indirectly through their landlords as rent. You can be sure the assessors are getting as much as they can from the slumlords shacks next to campus that go for $5,000/month. Just look at the campus area rental prices if you don't believe me--the students are paying their share of taxes. As for the dorms (populated almost entirely by freshman)? I'd love a state constituional amendment that dorms have to be taxed as any housing, but that's really only about 20% of the student population here. Are you really proposing we return to a feudal european system where only property owners get to vote? That's crazy and horribly disenfranchising--I think we're beyond that now. Mon, Mar 5, 2012 : 2:18 a.m. I received an increase in my property taxes because the assors says my house is worth more. So why does the AATA and the schools need a millage increase? The assor has taken care of the need for more millage. Easy. Taxation without representation. And yes the increase is on less then half the population of Ann Arbor who carry the burden of public schools and the City government. Isn't it time the rest of the population had skin in the system? They certainly have the vote. They can vote a millage increase no matter what the property owners say because they out number us. Just look at the student body at UoM. They can vote on millage issues yet they pay no propety taxes. In fact, they have a polling place right on campus. Makes it easy for them but hard on the residents. There are only two parking spaces. Seems like the spending Democrats did that one. AS I HAVE SAID BEFORE PROPETY TAXES ARE EVIL. I don't mind paying taxes if everyone did the same and half the city of Ann Arbor does not. Tue, Mar 6, 2012 : 2:52 p.m.
&quot;Taxation without representation?&quot; Baloney. Patrick Henry knew what he was talking about; you ought to find out. You have a mayor, you have a city council. If you feel the need to be politically active, go for it; you'll learn plenty in the process. It's out there, ready and waiting for you. The fact is that very few students vote on millages, just as very few property owners vote on them. Voter turnout for those elections is miserably low. If you want to have a major impact, get out there with some like-minded people and put together a really determined get-out-the-vote effort among your fellow property owners. Sun, Mar 4, 2012 : 5:10 p.m.
Mon, Mar 5, 2012 : 6 a.m.
Sun, Mar 4, 2012 : 7:48 p.m.
P.S. If the Fed was the root enabler, why did it take nearly a century for this to happen? Or if Fannie and Freddie's mortgage guarantees are to blame, why did it take nearly 70 years for market to blow up following the former's creation toward the end of the Great Depression? Right-wingers and zero-government types have been grumbling about Fannie and Freddie for decades, when in reality they have been highly successful in promoting affordable mortgages, a high standard of living and economic growth. Just because unregulated lenders went off on their own insane jaunt of zero-collateral lending does not mean the Fannie and Freddie model is not fundamentally sound. Sun, Mar 4, 2012 : 7:31 p.m.
Wrong, wrong, wrong. Fannie Mae and Freddie loans outperformed the nonconforming market during the crash and continue to do so. F&amp;F only got in on subprime mortgages toward the tail end of the bubble because their investors thought they were losing money by not doing them. The related notion that the 1977 Community Reinvestment Act promoting lending in low-income and minority neighborhoods is somehow to blame is also bogus. The Act affected only one of the 25 biggest subprime lenders. When CRA loans turned out to be profitable, that gave lenders the confidence to begin cutting their underwriting standards and developing shaky loan products targeted at the subprime market in general. But that was their own doing and was not in any way mandated by the CRA. Sun, Mar 4, 2012 : 6:45 p.m.
Yeah, and the head of the Fed at the time of all this, I shudder to even write his name lol, Alan Greenspan, was the most amazingly irresponsible 'root enabler' of them all. I would love to see him called to testify a little more before Congress, just to watch him 'explain' how all of this could have happened when he was so so certain it couldn't have. Sun, Mar 4, 2012 : 4:49 p.m.
That value wasn't &quot;lost.&quot; It never existed because the houses weren't actually worth that much. Reinflating the bubble would just kick the can down the road and keep first-time buyers out of the market. Sun, Mar 4, 2012 : 4:18 p.m. This whole mess could have been avoided, if not for a broken campaign promise...one of his bigger ones at that!!! Four more years of this....let's hope not!!!! Modification of home loans in bankruptcy was promised by candidate Obama before his election as President. Current bankruptcy law prohibits modification of a loan secured against the debtor's principal residence. The idea was simple, if bankruptcy judges were allowed to adjust the balance due and payment terms of home loans in Chapter 13 cases, many homeowners facing foreclosure would be able to keep their homes. The loan terms would become more affordable and the default leading to foreclosure would be eliminated. Sun, Mar 4, 2012 : 6:05 p.m.
um, which promise was that AND, more importantly, when was this made. the 'foreclosure crissis' started long before this guy was in office and the previous guy tried to pay off the banks. So who did what? Sun, Mar 4, 2012 : 4:09 p.m. If I have any extra cash I certainly wouldn't use it to pay down a severely underwater mortgage. It's like throwing it down a black hole. In this economy I would hang on to it and sock it away. Mon, Mar 5, 2012 : 2:52 p.m.
Read an article the other month saying the exact thing. With interest rates so low, there is really no need to hurry up. Sun, Mar 4, 2012 : 3:53 p.m.
Tue, Mar 6, 2012 : 10:50 a.m.
YpsiLivin, Thank you so much for taking the time to explain! Still hard to accept the concept that, as market value falls, taxes will continue to rise..... Also, the idea that, in the past, my taxes were &quot;artifically low&quot; blows my mind. I've always thought of Ann Arbor taxes as mind-numbingly high. Thanks!!! Sun, Mar 4, 2012 : 6:36 p.m.
Sun, Mar 4, 2012 : 3:33 p.m.
@JustMyOpinion is correct. With mortgage interest rates at a 60 year record low, now is the time to refinance and use the interest savings to pay down your mortgage as fast as possible. Starting March 17th a new government program kicks in. If you have an existing mortgage guaranteed by Freddie Mac or Fannie Mae (go to their websites for a quick way to check if you do) and have paid on time for the past year and have an income to continue to pay your mortgage payments, you will be able to refinance your existing mortgage to today's record low interest rates. This program will work no matter how far underwater you are since their is NO limit on loan to value (many but not all banks will offer this program). Feel free to contact me at ranzini@university-bank.com for more details. Sun, Mar 4, 2012 : 7:16 p.m.
Are you talking about HARP 2.0 or something else? HARP 2.0 has been in effect for several months now, but the banks are still coming up to speed on implementing it. I haven't heard about anything specifically tied to March 17, unless that's when one of the major banks plans to begin automated underwriting. Sun, Mar 4, 2012 : 6:35 p.m. Sounds like a loser program for the banks. Are our tax dollars going toward subsidizing the banks for this?! Or is it something the Feds have actually managed to require the banks to do as a sort of reparation for making all those questionable loans (and making all those questionable appraisals too!) in the first place?! Sun, Mar 4, 2012 : 3:12 p.m.
Sun, Mar 4, 2012 : 5:40 p.m.
And they are buying each others stressed properties to drive their own asset values back up. Cyclical scams in which the taxpayers will most certainly foot the bill. Sun, Mar 4, 2012 : 2:57 p.m.
At this point, all anyone can do is hang on and be glad they live in Washtenaw County, where the impact has been less than in other places in Michigan thanks to our low unemployment rate. I also don't think it makes sense to point fingers at one group or another when the entire nation is in the same boat, indicating the roots of the problem were national. This is simply 'put your nose to the grindstone' time. Take any chance you can to get the LTV down on your home and to pay off your mortgage. Don't think about what you have lost, only what you can reasonably hang on to. Lingering on your losses will only crush your drive forward. Sun, Mar 4, 2012 : 2:42 p.m.
Could this &quot;foreclosure crisis&quot; be attributable in large to confiscatory levels of taxation? We can test whether this is so by passing a new bus tax, passing a new technology tax, hiring an even more &quot;optimistic&quot; assessor, building a railroad and station for possible people, skimming and diverting appropriations, and electing those who promise to give us more than their unworthy cheap opponents promise. If our experiment doubles &quot;another 100,000 foreclosures in the coming year&quot;, tax-consumers like me can score some very cheap properties. It is a wonderful system. Tue, Mar 6, 2012 : 2:42 p.m.
We do not have &quot;confiscatory levels of taxation.&quot; What we have, and still have, is a vicious cycle of greed, in which people who truly wanted to believe that they could get rich just by buying more house than they could afford were quite willing to be treated to unpayable mortgages by real estate and finance professionals who knew how to avoid being the ones holding that paper when it went bad. When wishful thinking replaces reality checking on a broad scale, many, many fools will be parted from their money. Happy are they who can keep their heads when everybody around them is losing theirs. Sun, Mar 4, 2012 : 6:52 p.m.
Sun, Mar 4, 2012 : 6:32 p.m.
No, it is attributable to ridiculous levels of housing-bubble price increases over the years before it all came crashing down. And to greedy mortgage people and banks who lent the money to *anyone* regardless of income or job stability. And to greedy realtors who convinced naive buyers that they absolutely needed to buy homes or 'lose out'. The house is probably a great example of this. It probably sold for like 85K in 1995, if that, and then when the 'owner' who got foreclosed on bought it for 209K in 2005, having been told that it was a 'no-brainer' great idea to do, tried to sell it because the balloon mortgage went up to unaffordable for them, they had no luck. Pyramid schemes work like that, and housing had become even more of a ridiculous pyramid scheme than it had been shortly before. Anyway, I'm pretty sure all the realtors were telling the first-time buyers that there was a huge *tax benefit* to buying houses (not really for a lot of low-end income earners), so that absolutely couldn't be the problem ;-) !! Sun, Mar 4, 2012 : 2:36 p.m.
One Moral of this story: buy much less house than you can afford. Work hard to pay it off early. For those who just bought at the wrong time, I am truly sorry. For the ones who paid no attention to moral #1, I am not sorry. Sun, Mar 4, 2012 : 9:34 p.m.
@Local Lady: Right on! We ALWAYS bought 1/2 to 1/4 of what we were &quot;allowed&quot; by the bank. The clowns that went house poor were shocked when they went underwater. Sun, Mar 4, 2012 : 6:51 p.m. Precisely, @Soothslayer! With nothing to foreclose upon, though, I haven't considered the ramifications of *that*bubble bursting, yikes? Gotta check out the hypothesizing on that one, if you have any good references do share ;-) But clearly that one can't ever ever shake *that* debt, even if bankrupted, isn't surprising! Sun, Mar 4, 2012 : 5:39 p.m. So you're saying that if people weren't subject to buying a home at the wrong time people that instead they somehow deserved to be in foreclosure and were not hard workers? People looked upon the &quot;free money&quot; as a windfall and bought homes you insinuate they couldn't afford because banks allowed, and even encouraged, this behavior. Owning a home is the American Dream for many. Shame on the US taxpayer for allowing the de-regulation of our financial (and energy) institutions of which we are so heavily dependent upon. We let this happen and the banks knew full well their bets would be covered when the entire fake bubble market went south. Who encouraged the over inflated home market high to begin with? Gleeful Realtors and bankers who benefited for many years and at the expense of the American taxpayer. Don't try to justify righteousness through myopic good fortune. Next bubble to burst is student loans, where there is nothing to foreclose upon. Sun, Mar 4, 2012 : 2:07 p.m. So this picture, while part of the problem, probably isn't as representational of the foreclosure problem in Washtenaw county as say one of those McMansions in a subdivision or something on the west side or??? I would be interested in a comparison of what size and market price of the homes being foreclosed on in the county. Sun, Mar 4, 2012 : 1:59 p.m. It appears assessors are increasing the value of homes now too, welcome to the tax increases. Sun, Mar 4, 2012 : 1:45 p.m. It's good to know that the end of Michigan's problems are almost over. Sun, Mar 4, 2012 : 1:22 p.m.
800 billion for the banks,800 billion for wars,the Big fire storm 50 billion that's being paid back by Gm and Chrysler,and homeowners have property that's underwater and or under the ocean. the war machine gearing up for Iran. America's on the Brink. Sun, Mar 4, 2012 : 1:03 p.m.